Mimsy: Round Rock extends dangerously low speed limits on Highway 79? 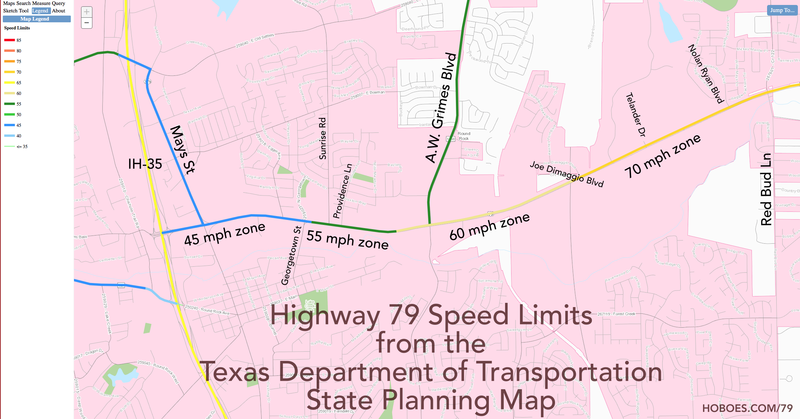 Further, Texas has a State Planning Map that, rather than showing lower speed limits along Highway 79, shows higher speed limits than currently exist, and these higher speed limits seem to match what the 85th percentile shows as the appropriate speed limits for the highway within Round Rock city limits. If there is a higher accident rate along Highway 79 in Round Rock caused by dangerously low speed limits, extending the too-low speeds further is likely to make the problem worse. Since the resolution reproduces only two of the speed surveys that were performed, I’m making the rest of them available here. For IH35 to just east of Mays, the survey between Mays and 35 (PDF File, 58.7 KB) shows an 85th percentile of 37 westbound and 35 eastbound. Rounding down to 35 still means a quarter of westbound drivers become lawbreakers. However, the proposed change continues 232 feet east of Mays, for which no survey was performed. There was a survey at 1320 feet east of Mays (PDF File, 58.8 KB). At that point the 85th percentile increased to 46 in both directions. However, the survey showing lower speeds between IH35 and Mays was performed on June 8, 2015, a Monday morning, at 9:00 AM. It’s strongly recommended not to perform surveys on Mondays or Fridays due to the potential for “exceptionally high traffic volume”. The higher speeds just east of Mays were found at 9:50 AM. The difference may simply be a matter of the time of day. For just east of Mays to A.W. Grimes, the survey shows that except for lunch hour traffic east of Georgetown Street (PDF File, 58.7 KB), the 85th percentile ranged from 49 (PDF File, 59.3 KB) to 52 (PDF File, 60.8 KB). For example, of the east of Providence traffic (PDF File, 84.1 KB), 44% would become lawbreakers at the proposed 45 mph speed limit and 48% of west of A.W. Grimes traffic (PDF File, 60.8 KB) would become lawbreakers. A better speed limit here seems to be 50 miles per hour or more. For A.W. Grimes to just east of Red Bud Lane, the 85th percentile at Joe DiMaggio (PDF File, 58.6 KB) was 60 westbound and 62 eastbound. A 55 limit makes 62% of drivers into lawbreakers. Similarly, the 85th percentile speed for east of Telander (PDF File, 59.2 KB) was 59 westbound and 67 eastbound. A 55 limit makes 50% of that traffic into lawbreakers. The more appropriate speed limit for this section appears to be 65 or 70, based on eastbound traffic, or at least 60 based on westbound traffic. Traffic counts during a Monday morning or a Friday peak period may show exceptionally high volumes and are not normally used in the analysis; therefore, counts are usually conducted on a Tuesday, Wednesday, and Thursday. “It is important to note,” the manual says, “that setting speed limits lower than 85th percentile speed does not encourage compliance with the posted speed limit.” The effects of raising and lower the speed limit on the speed drivers go are, in fact, very small. The bigger effect is an increase in the accident rate, because traffic flow becomes disjointed. In general, I’ve also been impressed, since moving here, by Round Rock’s willingness to revisit ideas that turn out to be bad ideas; last year they ended Round Rock’s speed camera program because the cameras were not meeting their professed goal of reducing accidents caused by running red lights. It may be that we’ll have to revisit this change, too. Incidentally, my open records request to them was handled very well; their representative was fast and efficient. I was impressed. Does Highway 79 around Georgetown Street experience a lunch hour rush? I think it does. I wanted to go to Georgetown this week for other reasons, and so decided to do so on Monday, detouring off of IH-35 to get to Georgetown via Highway 79, timing it so that I would be able to observe Highway 79 traffic before, during, and after the survey period. I learned two things from this. First, and anecdotally of course, but I think I saw significantly increased traffic on the road starting a little after 11:40 and well before noon, continuing through noon. There also seemed to be more vehicles bunching up at the traffic lights there. The second thing I learned is that Georgetown Street does not actually go to Georgetown. The worst was driving in New York a few years ago, wondering why all the traffic was weaving around me, when I realized that New York probably still had seventies-era speed limits, and that’s why this extraordinarily straight highway going across the wide part of the state was set at 55 mph. The speed limits from the Texas Planning Map for Highway 79 east of IH-35 and west of Red Bud Lane. The Radar Motor Vehicle Speed Field Tally Sheet from Monday, June 8, 2015, from 9:00 AM to 9:45 AM, between Mays St and IH 35. The Radar Motor Vehicle Speed Field Tally Sheet from Monday, June 8, 2015, from 9:50 AM to 10:35 AM, 0.25 miles East of Mays St. The Radar Motor Vehicle Speed Field Tally Sheet from Monday, June 8, 2015, from 10:40 to 11:30, 425 feet west of Georgetown St. The Radar Motor Vehicle Speed Field Tally Sheet from Monday, June 8, 2015, from 11:40 to 12:20, 490 feet east of Georgetown St. The Radar Motor Vehicle Speed Field Tally Sheet from Monday, June 8, 2015, from 1:30 to 2:30, 530 feet East of Providence Lane. The Radar Motor Vehicle Speed Field Tally Sheet from Monday, June 8, 2015, from 2:30 to 3:35, 0.25 miles West of FM 1460 (A.W. Grimes Boulevard). The Radar Motor Vehicle Speed Field Tally Sheet from Monday, June 8, 2015, from 3:20 to 4:00, 0.25 miles East of FM 1460 (A.W. Grimes Boulevard). The Radar Motor Vehicle Speed Field Tally Sheet from Tuesday, June 9, 2015, from 8:45 to 9:30, 1100 feet West of Joe Dimaggio Boulevard. The Radar Motor Vehicle Speed Field Tally Sheet from Tuesday, June 9, 2015, from 9:35 to 10:25, 150 feet East of Telander Drive. The Radar Motor Vehicle Speed Field Tally Sheet from Tuesday, June 9, 2015, from 10:40 to 11:45, 550 feet east of Nolan Ryan Boulevard. This zoomable and searchable map contains displays the results of several statewide databases. Round Rock extends dangerously low speed limits on Highway 79? last modified November 5th, 2016.